Franklin serves as president and CEO of the Billy Graham Evangelistic Association and the international Christian relief and evangelism organization Samaritan's Purse. He has met privately with five U.S. Presidents as well as world leaders from Europe, Africa, Asia and Latin America. As a speaker and author, Franklin regularly addresses current moral and social issues, challenging Christians to make a difference in the world. He also offers biblical context and application to current national and world events. Through the organizations he leads he has been instrumental in helping people impacted by crises including the 9/11 terrorist attacks, civil war in Sudan and natural disasters ranging from the tsunami in South Asia to the massive earthquakes in Haiti, China and Japan. Franklin conducted his first evangelistic event in 1989 and now conducts Franklin Graham Festivals around the world for the Billy Graham Evangelistic Association (BGEA). He has preached to more than 8.1 million people in cities from Johannesburg, South Africa to Tupelo, Miss. 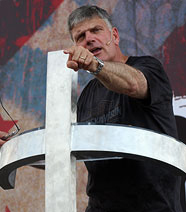 The Billy Graham Evangelistic Association appointed Franklin Graham CEO in 2000 and president of the organization in 2001. When Franklin was in his early twenties, Dr. Bob Pierce, founder of Samaritan's Purse, invited Franklin to join him on a six-week mission to Asia. It was during that time that Franklin felt a calling to work with hurting people in areas of the world affected by war, famine, disease, poverty and natural disaster. Franklin was elected to the Board of Samaritan's Purse in 1978, and one year later, following the death of Dr. Pierce, he was elected president of the organization. Today, he serves as president and CEO of the international relief and evangelism organization headquartered in Boone, N.C. It has affiliate offices in Canada, the United Kingdom and Australia, plus partners and field offices around the world. William Franklin Graham III, born July 14, 1952, is the fourth of five children of evangelist Billy Graham and his wife, the late Ruth Bell Graham. Raised in a log home in the Appalachian Mountains outside Asheville, N.C., Franklin now lives in Boone, N.C. In his autobiography, Rebel with a Cause, Franklin explained that “just being the son of Billy Graham won’t get me into heaven.” He knew that he was being called to do more with his life and to make a real commitment to God. So at age 22, after a period of rebellion and traveling the world, Franklin committed his life to Jesus Christ while alone in a hotel room in Jerusalem. Franklin and his wife, Jane, have four children, Will, Roy, Edward and Cissie, and 10 grandchildren.